Denver’s three-year-old Invesco Field at Mile High (now Sports Authority Field), hosted the 2004 Drum Corps International World Championships. The stadium is within yards of the site of the now-demolished Mile High Stadium, which hosted the DCI World Championships in 1977 and 1978. 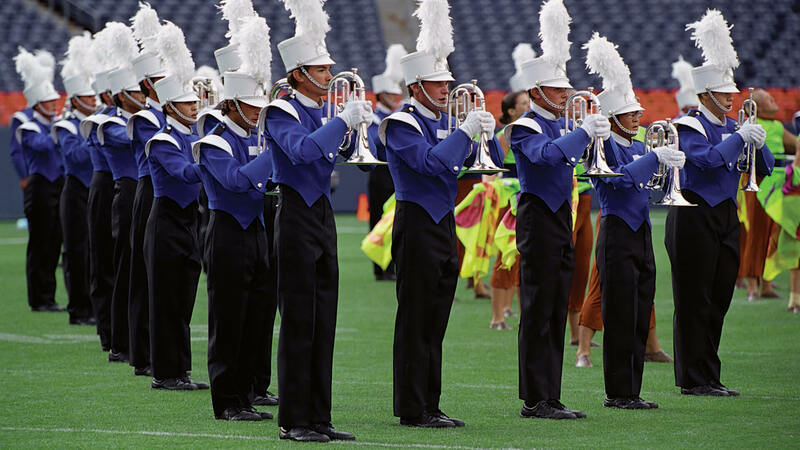 Much had happened during those intervening years since drum corps’ last trip to Denver, including rule changes allowing for the creation of the front ensemble percussion section and the use of any-key brass instruments, plus massive changes in drill design and color guard work. 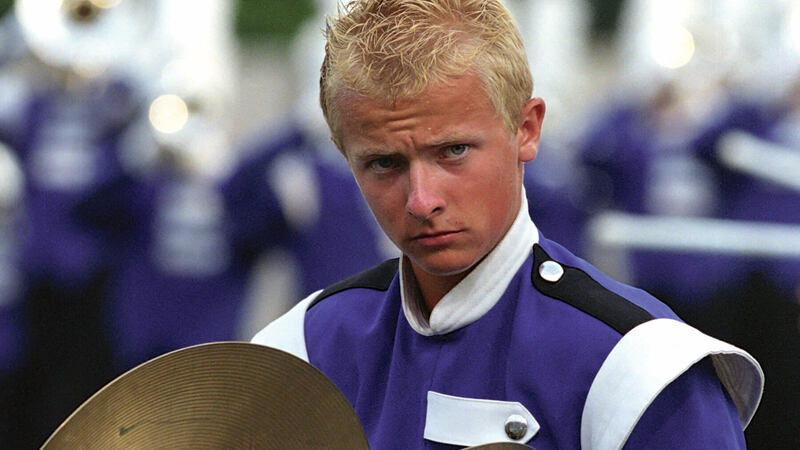 In 2004, Spirit from JSU missed the a top-12 spot in the Finals competition by only 0.075 points, followed by Semifinalists Capital Regiment, Seattle Cascades, Colts, and Magic of Orlando, the latter corps keeping Southwind out of Semifinals by just under a half a point. Following Southwind was Pacific Crest, Mandarins and Esperanza, three California corps that had moved up to World Class division that year. Holsinger is a prolific composer of concert band music, for which he has received a number of major band composition awards. For 15 years he was the music minister and composer-in-residence at Shady Grove Church of God, now Gateway Church Grand Prairie, located between Dallas and Fort Worth, Texas. The position allowed him to continue to write for concert bands while overseeing special productions for the church. Then, in 1999, he became conductor of the Lee University Wind Ensemble just outside of Chattanooga, Tennessee. Capital Regiment’s production explored the characteristics of the three titled building blocks of life, with the main segments of the show titled, “Mind,” “Body,” and “Spirit.” A final fourth segment, titled “A Celebration of Life,” recapped the prior three building blocks. As a unifying element, three color guard members—representing the mind, the body, and the spirit—were featured when each melody was first stated. Holsinger’s “Ballet Exaltare” launched the journey into “Mind,” with three distinct trumpet choirs opening the show with the melody, “Old Hundredth.” Although Holsinger briefly utilized fragments of the famed melody by French composer Loys Bourgeois, he didn’t base the composition on the tune. Rather, he created an angular and rhythmically pounding melody that was percussively dominant in both the drums and horns. The corps started entirely to the left of the 50-yard line, with the only color guard equipment being four abstract neon or pastel-swirled flags that were individually introduced, each of a different color and design. After the statement of “Old Hundredth,” the rest of the guard members picked up solid white flags, each a blank canvas for future color and design. A triangular block of horns swirled into a block box formation and evolved into another block triangle, the swirls in the drill and on the flags said to represent a metaphor for the complexity of the psyche. The entire color guard section moved to either rifles or bright swirled flags of the same color and design. At the end of the piece, another block box evolved into a block triangle. The second piece in the show was “Homage: Three Tapestries, Movement Two,” which was the music for the show segment titled, “Body.” The three movements of the original, written for a Catholic High School band, were conceived as a tribute to famed concert band composer Vaclav Nelybel, perhaps best known for works such as “Festivo,” “Trittico,” and “Symphonic Movement.” Holsinger largely based the entire work on liturgical themes from the Roman Catholic Church. Color guard performers moved to pastel silks to convey the smoother character of the music, and there was a Chagall-like abstraction of a man on the flags, which was extremely subtle and probably missed by anyone who wasn’t “in” on the reference. Capital Regiment staff members remarked that this propulsive and driving piece depicted the joy and exuberance of the human life force. Bright orange splotches of color on the color guard flags further enhanced that notion, while most of the performers utilized rifles to heighten the sense of feverish activity. The final portion of the show was titled “A Celebration of Life,” recapping all three elements of “Mind,” “Body” and “Spirit.” At the climax of the movement, “Old Hundredth” returned in a rather subdued fashion, played by a sextet of mixed horns. The piece gradually evolved to a triumphant restatement of “Old Hundredth,” with another block triangle evolving into a block box, amidst a sea of retina-searing neon flags. The show ended triumphantly with the horns, forming an open triangle, surrounding the color guard members. Capital Regiment finished in 15th and 16th places respectively over the next two years. These were positions still higher than anything the corps had experienced during its first five seasons, which led up to the corps’ 2004 campaign. The 2009 season, the corps’ ninth, would also be its last. For a limited time only, you can save on the DVD that contains this Capital Regiment performance. Buy the 2004 DCI World Championship Volume II DVD.